Welcome to Today@WKU, the daily newsletter from WKU Public Affairs, for October 24, 2018. 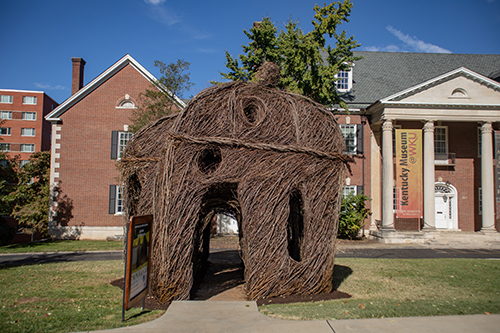 Highbrow, the Stickwork at WKU sculpture made from intertwined tree saplings, is open on the Kentucky Museum's front lawn. Student Selected as Finalist in Data Analytics Research Competition: Gordon Ford College of Business student Kyla Scanlon was selected as a finalist for the 2018 Teradata Analytics Universe Conference, which was held October 14-18 in Las Vegas. Scanlon, an economics, finance, and data analytics triple major from Louisville, was awarded the TUN Student Scholarship, which covered her expenses for the conference. Parking & Transportation promotions for Sustainability Day: In support of Sustainability Day, PTS will be offering several promotions today. PTS will be providing doughnuts and hot chocolate at three Commuter bus stops this morning, launching a new Carpool Preferred Parking Program and giving campus a sneak peek at one of the new VeoRide bike share bicycles. WKU Folk Studies at the Annual Meeting of the American Folklore Society: WKU Folk Studies has just returned from another successful and productive Annual Meeting of the American Folklore Society. This year's meeting was in Buffalo, New York. Faculty, current students, and alumni presented papers, served on forums, participated in leadership meetings and AFS section meetings, caught up with colleagues, and had a good time. Carlton Jackson Papers Celebrate Archives Month: Heartbreaking memories of the 1918 influenza pandemic. The FBI dossiers on a husband-and-wife team of socialist labor activists. Gracious letters from Gone With the Wind star Olivia de Havilland. The gritty details of a guest’s sudden collapse and death during a television talk show. Accounts from survivors of one of America’s worst wartime naval disasters. Where can you find all of these within easy reach of one another? In the papers of Dr. Carlton L. Jackson, a prolific author and historian who donated a large portion of his research and manuscripts to WKU’s Department of Library Special Collections. What’s Happening at WKU: Check out a list of events through Nov. 10. Men’s golf: Sargent Wins Fourth Career Title in Playoff at Kennesaw State: On the first playoff hole Tuesday, WKU's Billy Tom Sargent almost hit his tee shot out of bounds. But there was no stopping the Hilltopper Golf redshirt senior on this day. Sargent stormed to victory at Kennesaw State's Pinetree Intercollegiate with a 7-under 65, then claimed outright individual medalist honors by salvaging par on the opening playoff hole after the wayward tee shot. The win is the fourth career victory for Sargent, who dedicated it to former WKU coach Phillip Hatchett after his passing in June. Football: Practice Report: WKU Football finished out practice Tuesday evening as the Hilltoppers prepare for Saturday’s game against Conference USA opponent FIU. Kick off for the Homecoming game at Houchens-Smith Stadium is set for 6:30 p.m. CT and it will be broadcasted on beIN Sports. WKU's young offense shows big strides despite latest loss: Buried deep in a three-game losing streak, having lost four games this season each by three points, it may be hard to find positive building blocks for WKU moving forward. But a closer look at Saturday’s 37-34, head-scratching loss to Old Dominion reveals what might arguably be one of WKU’s best offensive games in the Mike Sanford era. And the plays being made throughout the game’s 60 minutes were all mostly executed by Hilltoppers who will be back in 2019.